22All this took place to fulfill what the Lord had said through the prophet: 23"The virgin will be with child and will give birth to a son, and they will call him Immanuel"[Isaiah 7:14]—which means, "God with us." 24When Joseph woke up, he did what the angel of the Lord had commanded him and took Mary home as his wife. 25 But he had no union with her until she gave birth to a son. And he gave him the name Jesus. 4 So Joseph also went up from the town of Nazareth in Galilee to Judea, to Bethlehem the town of David, because he belonged to the house and line of David. 5 He went there to register with Mary, who was pledged to be married to him and was expecting a child. 6 While they were there, the time came for the baby to be born, 7and she gave birth to her firstborn, a son. She wrapped him in cloths and placed him in a manger, because there was no room for them in the inn. 46 While Jesus was still talking to the crowd, his mother and brothers stood outside, wanting to speak to him. 47 Someone told him, "Your mother and brothers are standing outside, wanting to speak to you." 48 He replied to him, "Who is my mother, and who are my brothers?" 49 Pointing to his disciples, he said, "Here are my mother and my brothers. 50 For whoever does the will of my Father in heaven is my brother and sister and mother." 53 When Jesus had finished these parables, he moved on from there. 54 Coming to his hometown, he began teaching the people in their synagogue, and they were amazed. "Where did this man get this wisdom and these miraculous powers?" they asked. 55 "Isn't this the carpenter's son? Isn't his mother's name Mary, and aren't his brothers James, Joseph, Simon and Judas? 56 Aren't all his sisters with us? Where then did this man get all these things?" 57 And they took offense at him. But Jesus said to them, "Only in his hometown and in his own house is a prophet without honor." 22 And the teachers of the law who came down from Jerusalem said, "He is possessed by Beelzebub ! By the prince of demons he is driving out demons." 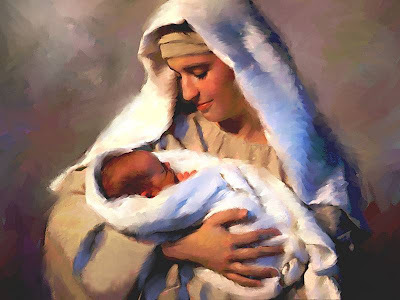 . . . .
Jesus' Mother and Brothers 31 Then Jesus' mother and brothers arrived. Standing outside, they sent someone in to call him. 32 A crowd was sitting around him, and they told him, "Your mother and brothers are outside looking for you." 33"Who are my mother and my brothers?" he asked. 1 On the third day a wedding took place at Cana in Galilee. Jesus' mother was there, 2 and Jesus and his disciples had also been invited to the wedding. 3 When the wine was gone, Jesus' mother said to him, "They have no more wine." 4 "Dear woman, why do you involve me?" Jesus replied, "My time has not yet come." 7 Jesus said to the servants, "Fill the jars with water"; so they filled them to the brim. 8 Then he told them, "Now draw some out and take it to the master of the banquet." They did so, 9 and the master of the banquet tasted the water that had been turned into wine. He did not realize where it had come from, though the servants who had drawn the water knew. Then he called the bridegroom aside 10 and said, "Everyone brings out the choice wine first and then the cheaper wine after the guests have had too much to drink; but you have saved the best till now." 11 This, the first of his miraculous signs, Jesus performed in Cana of Galilee. He thus revealed his glory, and his disciples put their faith in him. 1 After this, Jesus went around in Galilee, purposely staying away from Judea because the Jews there were waiting to take his life. 2 But when the Jewish Feast of Tabernacles was near, 3 Jesus' brothers said to him, "You ought to leave here and go to Judea, so that your disciples may see the miracles you do. 4 No one who wants to become a public figure acts in secret. Since you are doing these things, show yourself to the world." 5 For even his own brothers did not believe in him. 6 Therefore Jesus told them, "The right time for me has not yet come; for you any time is right. 7 The world cannot hate you, but it hates me because I testify that what it does is evil. 8 You go to the Feast. I am not yet going up to this Feast, because for me the right time has not yet come." 9 Having said this, he stayed in Galilee. 10 However, after his brothers had left for the Feast, he went also, not publicly, but in secret. 11 Now at the Feast the Jews were watching for him and asking, "Where is that man?" 12 Among the crowds there was widespread whispering about him. Some said, "He is a good man." Others replied, "No, he deceives the people." 13 But no one would say anything publicly about him for fear of the Jews. 1 Paul, an apostle—sent not from men nor by man, but by Jesus Christ and God the Father, who raised him from the dead— 2 and all the brothers with me, To the churches in Galatia: . . . . 18 Then after three years, I went up to Jerusalem to get acquainted with Peter and stayed with him fifteen days. 19 I saw none of the other apostles—only James, the Lord's brother. 1 Am I [Paul] not free? Am I not an apostle? Have I not seen Jesus our Lord? Are you not the result of my work in the Lord? 2 Even though I may not be an apostle to others, surely I am to you! For you are the seal of my apostleship in the Lord. 3 This is my defense to those who sit in judgment on me. 4 Don't we have the right to food and drink? 5 Don't we have the right to take a believing wife along with us, as do the other apostles and the Lord's brothers and Cephas[Peter] ? 6 I am astonished that you are so quickly deserting the one who called you by the grace of Christ and are turning to a different gospel— 7 which is really no gospel at all. Evidently some people are throwing you into confusion and are trying to pervert the gospel of Christ. 8 But even if we or an angel from heaven should preach a gospel other than the one we preached to you, let him be eternally condemned! 9 As we have already said, so now I say again: If anybody is preaching to you a gospel other than what you accepted, let him be eternally condemned! 24 For Christ did not enter a man-made sanctuary that was only a copy of the true one; he entered heaven itself, now to appear for us in God’s presence. 25 Nor did he enter heaven to offer himself again and again, the way the high priest enters the Most Holy Place every year with blood that is not his own. 26 Then Christ would have had to suffer many times since the creation of the world. But now he has appeared once for all at the end of the ages to do away with sin by the sacrifice of himself. 27 Just as man is destined to die once, and after that to face judgment, 28 so Christ was sacrificed once to take away the sins of many people; and he will appear a second time, not to bear sin, but to bring salvation to those who are waiting for him. 11 Day after day every priest stands and performs his religious duties; again and again he offers the same sacrifices, which can never take away sins. 12 But when this priest [Jesus] had offered for all time one sacrifice for sins, he sat down at the right hand of God. 13 Since that time he waits for his enemies to be made his footstool, 14 because by one sacrifice he has made perfect forever those who are being made holy. 3 “You shall have no other gods before [Or besides] me. 4 “You shall not make for yourself an idol in the form of anything in heaven above or on the earth beneath or in the waters below. 5 You shall not bow down to them or worship them; for I, the LORD your God, am a jealous God, punishing the children for the sin of the fathers to the third and fourth generation of those who hate me, 6 but showing love to a thousand generations of those who love me and keep my commandments. 3 I am afraid that just as Eve was deceived by the serpent’s cunning, your minds may somehow be led astray from your sincere and pure devotion to Christ. 4 For if someone comes to you and preaches a Jesus other than the Jesus we preached, or if you receive a different spirit from the one you received, or a different gospel from the one you accepted, you put up with it easily enough. . . .